Notes: Dullingham station is about 1 mile north-west of the village centre, and it opened with the Newmarket and Chesterford Railway on 4 April 1848. The station closed with the line on 1 July 1850, reopening on 9 September 1850. In the early days trains stopped at the station only by request. 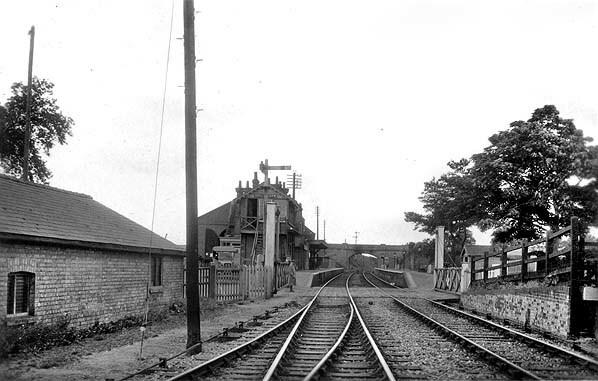 The station was provided with two facing platforms between Station Road (originally called Stoney Lane) and Farm bridge (destroyed by a German bomb during WW2). 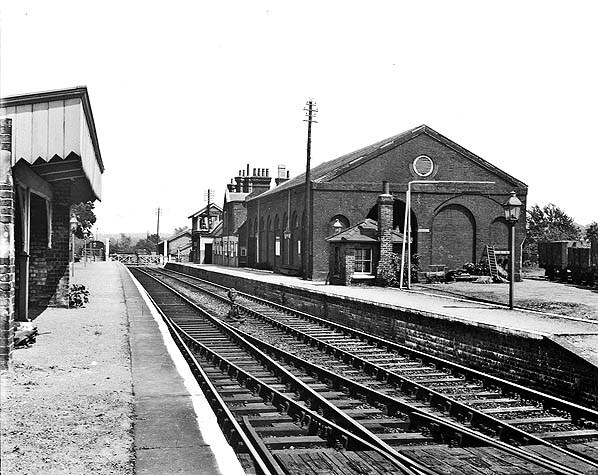 The main station building was on the up platform and remained largely as built although the station house was extended, probably by the Great Eastern Railway. 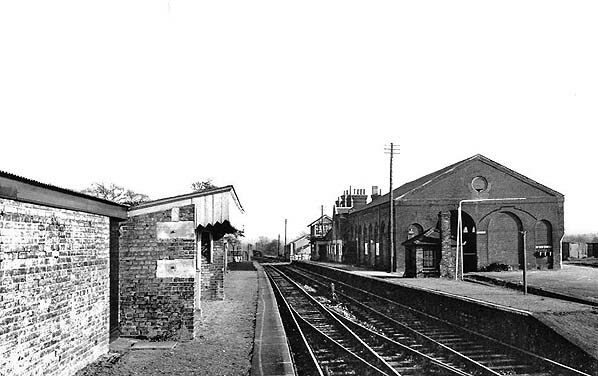 The station building was of brick with pitched pantile roofs and raised gables. The layout was T-shape, with single-storey wings either side of the two-storey station house, the north-eastern wing being the longer. The station house presented gables to the platform and forecourt elevations, but what appears to be a two-storey extension to the south-west had either a flat roof, or a sloping one concealed by a parapet at each end. On the forecourt a shaped gable added interest at the meeting of the two-storey station house and the north-eastern wing probably over the original passenger entrance adjacent to a later flat-roofed glazed timber extension which then housed the passenger entrance. A brick lean-to addition for the gents’ toilet was at the north-eastern end. The profile of the building was enhanced by conspicuous chimneystacks set at 45deg from the alignment of the building; two were slender, coupled structures and a further one served four fireplaces, and each broadened at the top. A further unadorned chimneystack stood at the south-west end of the two-storey section. A flat timber canopy with a fretted valance stretched part way across the platform in front of the building; this was removed before the station closed. Competition between stations on the line was always fierce as to which one had the best-kept station and gardens. 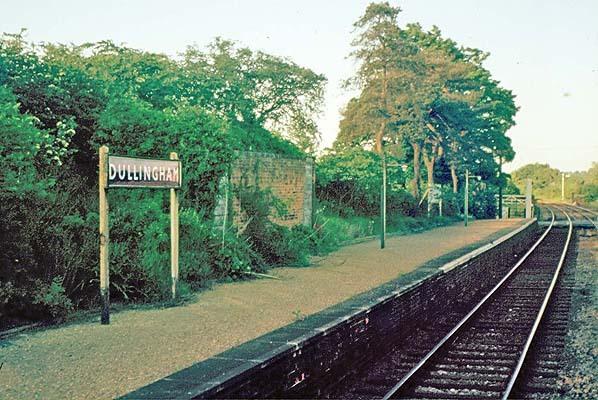 Dullingham station was always immaculate, with very colourful flower borders. At the west end of the platform there was a small square brick building with windows and a chimney. This is believed to have been provided as a rest room for shunters, or possibly for crew waiting for their train. In later years it was used as a lamp room with a work bench and storage for lamp oil. The up platform was somewhat shorter than the down in order to accommodate access to the goods yard to the rear. The down platform was provided with an open-fronted timber shelter; this had a sloping awning with fretted valance stretching part way across the platform, and it was provided after the ECR received a request from local residents in October 1861. Adjacent to the shelter there was a second gents' toilet at the back of the platform. Further west along the down platform was a goods lock-up. In November 1854 plans were prepared for goods warehouse at Dullingham, and the Cambridge Chronicle for December 1855 reported that the shed had been built. The large brick shed backed onto the up platform. It had a pitched roof and its north-west wall was visually enlivened by a series of arches, with brick infill except for small semi-circular windows at the summit of the arches. A siding ran through the shed and a loop from it ran round the shed to the south. There was a head-shunt off this loop adjacent to the small yard crane. ECR minutes of 3 February 1858 state that a 2-ton crane was to be installed but the Railway Clearing House handbooks for 1904 and 1956 both list the capacity as 1 ton 10 cwt. On 18 April 1855 half an acre of surplus land at the station was sold to a Mr King for £150 to erect a steam flour mill and premises. There was a siding serving a cattle dock and pens reached from trailing points on the east side of Station Road. Livestock could be loaded only end-on to the dock, and a fence was provided along one side of the dock to prevent them from falling onto the down main line. Opposite the dock the Station Maltings were also rail served with a siding running alongside a timber loading dock. GER records show a weighbridge was not provided at the station until 1909. 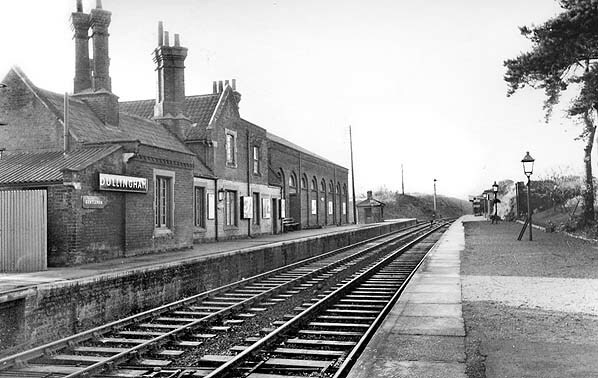 An accident occurred at Dullingham on 29 April 1873 when the rear portion of a down goods at the station ran one mile towards Cambridge past Six Mile Bottom station. The goods guard was dismissed for ineffectual braking. A trap siding was proposed after the incident. There was a signal box on the up platform between the main building and the crossing. The box initially controlled only the level crossing (although the gates were, and still are, hand operated), local signals and siding releases. In May 1905 the Devil's Dyke signal box between Dullingham and Newmarket, was abolished because of its proximity to the new Newmarket station which opened in 1902. The Dullingham box was then converted to a Block Box, making the Newmarket station - Dullingham and the Dullingham - Six Mile Bottom Block Sections more convenient from a traffic point of view. The goods yard closed on 28 December 1964 although a private siding remained open after that date. The goods yard was cleared in 1966 and is largely undeveloped today. As a result of these developments, on 4 October the same newspaper was able to report that some stations on the line had been given a reprieve and that Dullingham, Kennett, Thurston and Elmswell would remain open but the others would close. 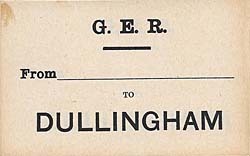 Although Dullingham remained open it became unstaffed (apart from the signalman) from 2 January 1967. 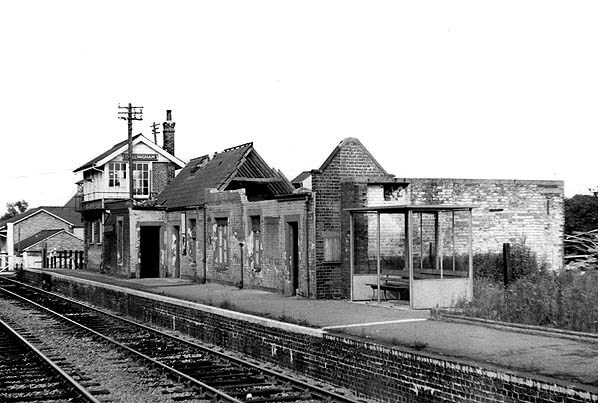 The station buildings were demolished over the winter of 1971/2 leaving only the signal box, gents' toilet (retained for the use of the signalman) and lamp room standing on the up platform. 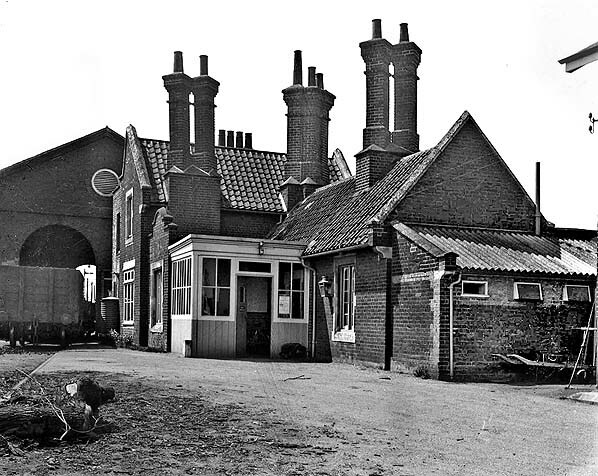 In a tour of East Anglian railways in June 1973 one of the ‘Disused Stations’ team found that Dullingham and Shippea Hill were the only unstaffed stations where the main buildings had been demolished. The once rail-served Station Maltings were destroyed by fire in latter half of the 1970s. At the time the building was being used as a grain store, having stood empty for many years. The line was singled in 1983 but Dullingham was retained as a remote passing loop on the otherwise single line between Cambridge and Chippenham Junction. While other boxes on the line were closed, the box at Dullingham remained open with manually-operated crossing gates also retained. The gates were renewed in March 2009. Although at casual inspection the station looks like a standard double-track station the train operation is somewhat different. The main line passes the the former up platform (platform 2); all westbound services use this platform, but the main-line is signalled bi-directionally and unless trains are required to cross at Dullingham eastbound services typically use this line too. At the time of writing the only regular passenger service to use the former down platform (platform 1) is the train at around 0800 to Ipswich which passes a train to Cambridge at Dullingham. Platform 2 (on the loop line) is only signalled to allow eastbound services to use it. Fast passing services always use the main line if possible - there is a speed restriction on the loop. The service pattern typically allows for alternate trains to call at either Dullingham or Kennett; Sunday services typically call at both. Timetables are not totally consistent in this way. The station, and all trains serving it, are operated by Greater Anglia. Facilities are limited to a free car park and a small shelter on platform 1 by the signal box. There is no ticket machine but there is a device to communicate with Greater Anglia control. Tickets are sold by the conductor on the train. Apart from the 'first sod' of the Newmarket & Chesterford Railway being cut at Dullingham, the station's main claim to fame came in 1895 when a two-year old racehorse, ‘Persimmon,’ owned by Queen Victoria’s son, the Prince of Wales, almost missed attending the Derby on 3 June 1886. Click here for a detailed description of the signaling equipment at Dullingham after the line was singled in 1983. The first proposal for a railway to serve Newmarket came in 1845 when a prospectus for the ‘Newmarket and Chesterford Railway with a branch to Cambridge ‘ was issued in October for a 17½-mile line from half a mile north of Chesterford on the Eastern Counties Railway's London - Cambridge line which opened on 30 July 1845. The proposed line would provide a fast commuter route between Newmarket and the Capital. The promoters were lucky to obtain the services of engineers Robert Stephenson, who already had an extensive portfolio of new lines, and John Braithwaite, who had been Engineer-in-Chief to the Eastern Counties Railway until May 1843. The proposed new line quickly received much social and political support including that of John Manners, 5th Duke of Rutland, who owned the Cheveley Park Estate. Cheveley Park is the oldest stud in Newmarket, with evidence that the site has been used for breeding horses since the reign of　Athelstan (924–939). While many new railways were constructed primarily to serve industry, the influential Jockey Club was of the opinion that “a railway to Newmarket would not only be a great convenience to parties anxious to participate in the truly British sport of racing but would enable Members of Parliament to superintend a race and run back to London in time for the same night’s debate“. As a result, the Company’s Bill was unopposed and had an easy passage through Parliament, receiving Royal assent on 16 July 1846. Share capital of £350,000 was authorised with borrowing powers of £116,666. The Act contained a number of unusual clauses including one that forbade the company from taking on board or setting down passengers at Cambridge station or within three miles of the station between 10am and 3pm on Sundays. Any contravention would incur a £5 per person fine payable to Addenbrooke’s Hospital or another charity nominated by the University. The contract for construction was awarded to the well known railway contractor Thomas Jackson, and the ceremony for the ‘turning of the first sod’ took place at Dullingham on 30 September 1846. On 11 November 1846 the N & C convened a shareholders’ meeting to approve an agreement with the Eastern Counties Railway to lease the main line between Newmarket and Chesterford and the Cambridge branch upon completion. Following objections from the Eastern Counties this was not approved and, as a reprisal, the N & C proposed a line from Chesterford to make a connection with the Great Northern Railway (under construction at that time) at Royston. This would have provided and independent route into East Anglia using connections with the Norfolk Railway at Thetford, and the Eastern Union Railway at Bury St Edmunds. In June 1847 the Company obtained Acts to extend its line to Bury with a branch to Ely and to Thetford, which would have provided a new through route to Norwich with a connection to the Norfolk Railway which ran from Brandon to Norwich and Yarmouth. None of the lines were built at this time due in part to friction between the Eastern Counties and the Norfolk Railway, with the Newmarket & Chesterford Railway becoming a pawn in the acrimonious negotiations between the two larger companies. While these complex ‘games’ were being played out, construction of the twin-track line proceeded rapidly, and in 1847 the Newmarket & Chesterford Railway changed its name to the Newmarket Railway. Further unsuccessful negotiations with the Eastern Counties Railway to lease or amalgamate with Newmarket Railway took place in February 1848. Following this failure to reach an agreement, the Newmarket Company approached the Norfolk Railway who agreed to transfer the proposed Thetford – Newmarket route to them. This proposal would have diverted around £40,000 worth of traffic away from the ECR onto the Newmarket Railway but, before an agreement was reached, the ECR changed its mind and approached the Newmarket Company with a new proposal. An agreement was reached on 27 March allowing the ECR to take over the management of the line. As a result, the Newmarket Company deferred its agreement with the Norfolk Railway and abandoned its own scheme to extend its main line south-west to Royston. As part of their agreement, the ECR would provide funds to liquidate the liabilities of the Newmarket Railway and to complete the Cambridge branch. Newmarket shareholders would receive a guaranteed dividend of 3 per cent for two years and, thereafter, 3 per cent. On 3 January 1848 the Newmarket Railway opened its main line to goods traffic, opening fully on 4 April 1848, with intermediate stations (from south to north) at Bourn(e) Bridge, Balsham Road, Westley (later renamed Six Mile Bottom) and Dullingham. The rolling stock included six tender locomotives (Twelve were ordered but only six were delivered, the remainder going to the Stockton & Darlington Railway). built by Gilkes, Wilson and Company of Middlesbrough, first class, second class and third class carriages, luggage vans and horse boxes. The Company timetable for August 1848 shows four passenger trains on weekdays in each direction with two on Sundays. At that time passengers wishing to continue to Bury St Edmunds had to travel by horse and carriage from Newmarket. The result of the three months up to 30 June 1848, showed that the total traffic receipts were £3,085 7s 7d and the running expenses £2,059 5s 7d, showing a balance of £1,026 2s Od. The Newmarket Company ran its own line for only ten months with the ECR taking control of the management on 2 October 1848. This agreement still, however, had to be approved by ECR shareholders. By this time the fortunes of ‘Railway King’ George Hudson had begun to decline. Hudson had been appointed Chairman of the ailing Eastern Counties Railway in 1845. He was interested in the ECR as he felt it offered an opportunity for an alternative route from York to London, although the truth was the ECR had an appalling reputation for time-keeping and safety at this time. Hudson immediately ordered the payment of a generous dividend for the shareholders. In 1848 a pamphlet called ‘The bubble of the age’ or ‘The fallacy of railway investment, Railway Accounts and Railway dividends’ alleged that the dividend of Hudson’s companies was paid out of capital rather than revenue. Hudson had been borrowing money at a high interest rate to keep some of his companies afloat, and many of these companies were left in a difficult position with falling revenues in an economic depression and little scope for future shareholder dividends. By October 1848 it seemed doubtful whether the disgruntled ECR shareholders would approve the agreement with the Newmarket Railway. At the ECR’s Annual General Meeting on 28 February 1849 Hudson and his Directors decided not to put the confirmation of the agreement before the shareholders. Hudson decided not to attend to face the wrath of the shareholders, and within a short time he was forced to resign and the agreement with the Newmarket Railway was scuppered. Having taken over control of the line without the agreement of its shareholders the ECR did its best to force the Newmarket Railway out of business by forcing exorbitant running costs on the company. The ECR introduced a charge of 1s 5d a mile for locomotives, much in excess of the normal rate elsewhere, and it also charged the Newmarket Railway £600 a year for the management or rather, as the Chairman of the Newmarket Railway had no hesitation in calling it, the ‘mismanagement’ of the line. During the three months to 4 January 1849 the Newmarket Company made a profit of only £704, out of which they had to pay bond interest of £2,000, a problem rendered all the more difficult because the Eastern Counties Railway held on to even this small balance on the grounds of alleged other claims; in addition the Newmarket Company had to defray out of capital the cost of maintaining the permanent way and stations. On 22 March 1849 a committee was set up to look into the affairs of the company. The committee was chaired by Cecil Fane, a Commissioner in Bankruptcy. In his report presented on 14 May 1849 Fane was of the opinion that the only way of saving the company was to construct the Cambridge branch. The Newmarket Railway considered regaining control of the line and approaching contractor Thomas Jackson to take over the operation; nothing came of this or a further appeal to the Eastern Counties Railway for more lenient terms. Without funds to pay Jackson to build the Cambridge branch it was soon clear that the only option was to close the line which was quickly effected without consulting the shareholders. The line closed to all traffic on 30 June 1850 just 2½ years after it opened, and Newmarket lost its rail connection. The ECR took all the company’s rolling stock in lieu of existing debts. With no income, and mounting debts, the company had no option other than to go into administration under the control of Commissioner Fane who soon made it clear that he was unimpressed by the manner in which the directors had closed the line without calling a shareholders’ meeting. He criticised the decision to build the line from Chesterford (a small village) rather than Cambridge (a large town) and reprimanded the Board for mishandling negotiations with the Norfolk and Eastern Counties Railways. A meeting of shareholders was eventually called on 27 July 1850 at which the existing Newmarket board was replaced by Cecil Fane and a new board of Directors. The line was reopened between Newmarket and Chesterford on 9 September 1850 using rolling stock borrowed from the Eastern Counties Railway. G W Brown was appointed Manager, and he was quickly able to increase revenue and reduce running costs. All outstanding debts were renegotiated and settled amicably, and Fane was even able to convince the ECR to permit trains to run into its station at Cambridge, avoiding the unnecessary expense of a separate station. Under the Eastern Counties and Newmarket Railways Arrangements Act 1852 the ECR agreed that in any year after the opening of the Cambridge branch in which the revenue was insufficient to pay a dividend of 3 per cent on the Newmarket Company’s capital of £350,000, the Eastern Counties Railway would make it good up to not exceeding £5000 in any one year. In the first year of operations this agreement cost the ECR £3,705 9s 7d. At this point it’s worth mentioning that some strange discrepancies appeared in the track mileages which ‘moved’ Dullingham and Six Mile Bottom stations much closer to Newmarket. Although technically this would mean a loss of revenue at the Newmarket end of the line, it had the knock-on effect of increasing mileages from Newmarket, Dullingham and Six Mile Bottom to the Chesterford section stations. This may account for the high fares applied to the latter section during the course of its existence, thus hastening its demise. However, although skulduggery is suspected it is not known if this was indeed the case. The suspect mileages appear in a number of surviving Bradshaw’s Guides but, significantly, not until the ECR had taken over operation of the line. Having settled the debts owed to Thomas Jackson the contractor agreed to finish the line at a cost not exceeding £9,000. Cecil Fane had an ingenious plan for financing the construction costs. As built, the Chesterford – Cambridge line was double track, but it was clear that the volume of traffic that would be handled by the line once the Cambridge branch was opened could easily be accommodated on a single line with passing places. On the southern section of the line one set of rails and sleepers were lifted, and these provided 11 miles of track and sleepers which could be used for the Cambridge branch, far in excess of what was needed. Construction of the single-track branch was far from plain sailing as the connection with the Eastern Counties Railway at Cambridge proved problematic. The plans approved by Parliament showed a curve at the junction with a radius of 20 chains but, owing to circumstances beyond the control of the company, it was necessary to realign the curve to one with a radius of only 8 chains. This deviation required the consent of the Commissioners of Railways but was turned down as the company’s powers of compulsory purchase had expired and the approval of the landowners involved had not been received. The impasse was eventually resolved and the line was completed. An inspection place on 7 October 1851 and, with approval now received, the Cambridge branch opened to all traffic on 9 October 1851. By this time it was clear that the Chesterford line would never be profitable so it closed permanently on 9 October 1851, coinciding with the opening of the Cambridge branch; the service from Newmarket was diverted onto the new branch from that date despite the distance between London and Newmarket increasing by 7½ miles. The last timetable issued in August 1851 showed three trains in each direction and no Sunday service. Trains stopped at the intermediate stations only by request. Two intermediate stations on the Cambridge branch were provided at Cherry Hinton and Fulbourne. Neither of these was ready for the opening of the line and they did not appear in Bradshaw until August 1852. Cherry Hinton station was very short-lived closing permanently in March 1854. The new line was an immediate success and quickly revived the fortunes of the company. Four months later the Company declared a dividend of 1s 6d with a further dividend of 5s 0d being paid the following August: a paltry return on a £25 share, but considering that the company had just come out of bankruptcy it was a promising rebirth. 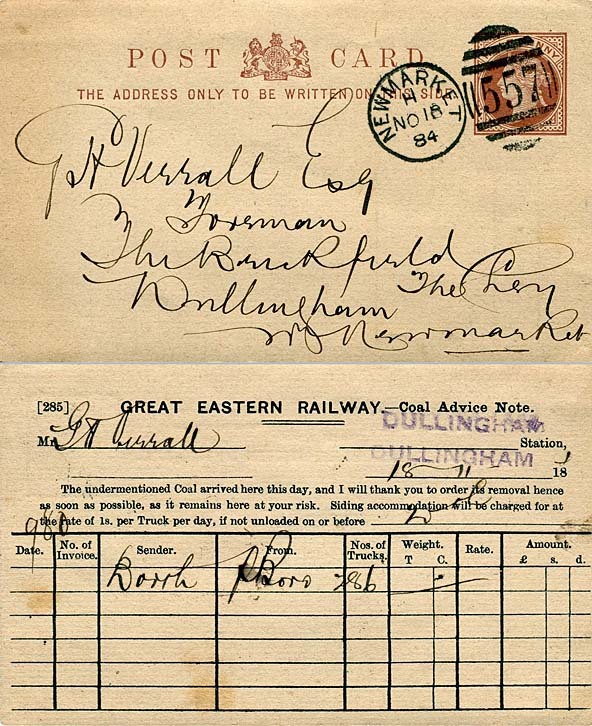 An Act of 1852 authorised the Eastern Counties Railway to purchase the Newmarket Company at any time. It exercised this right and took over the Newmarket Company’s bond debt of £116,666, and by 30 June 1854 had paid off the debentures of £210,000 in cash which they had issued in purchase of the Newmarket Company’s lines. They thus paid £326,923 for 13 miles of line between Cambridge and Newmarket and included the redundant track between Six Mile Bottom and Great Chesterford which was not officially abandoned until 1858. The ECR timetable for 1853 shows three trains in each direction on weekdays, with trains stopping at the four intermediate stations only by request. The ECR minutes for 10 August 1854 record that the line of the route from Six Mile Bottom is to be abandoned and the land offered to the original owners. An ECR working timetable from September 1856, five years after the southern section of the Newmarket Railway closed but two years before the Act of Abandonment, confirms there was no goods traffic over the old line, and it is likely there was no traffic of any kind after 1851. The minutes of the ECR make reference to ‘Chesterford Junction’ at least as late as 1856 but not of the junction at Six Mile Bottom after the 1851 closure. This suggests the junction at Six Mile Bottom was removed but the remaining single track remained connected at Chesterford, probably until after the Abandonment Act which was passed on 8 July 1858. Between 1852 and 1854 the Newmarket line was extended north to Bury St Edmunds, thereby completing the route to Ipswich. This extension involved tunnelling 1099yd under the Warren Hill training grounds to the north of the 1848 station. When the Bury St Edmunds extension opened on 1 April 1854, trains running into the old terminus then had to reverse out of the station to continue their journey to Bury. Under an Act of 1862 the Eastern Counties, East Anglian, Newmarket, Eastern Union and Norfolk Railways and about thirty smaller companies amalgamated to form the Great Eastern Railway. Doubling of the line between Cambridge and Six Mile Bottom was completed in the second half of 1875. When the line from Newmarket to Ely opened on 1 September 1879, bringing additional through traffic, the awkward reversal was avoided by opening a new island platform at a slightly lower level east of the original terminus. The new platform was usually referred to as the ‘Lower’ station. For some years Newmarket was, in effect, two separate stations although they did share a restaurant. The original single upper platform was used by trains from Cambridge terminating at Newmarket while the lower island was used by through trains to Bury and Ely. On 14 September 1880 GER minutes record a proposed revival of the abandoned line between Chesterford to Six Mile Bottom and an estimate of the cost of land and works was requested. Although a revival of the line was again discussed in 1892 and 1893 it was always deferred and no action was ever taken. On 21 April 1885 a non-timetabled station called Warren Hill was opened at the north end of Warren Hill Tunnel. This was built to cater for the increasing number of passengers arriving from the east and the north on race days. At Cambridge major platform lengthening and remodelling of the main building took place in 1863, and the station layout was altered in 1896 by deviating the Newmarket line approaches with a new alignment curving round to the north of the Romsey Town area of Cambridge to a new junction with the Ely – Cambridge line at Coldham Lane Junction. This avoided the delays caused by the previous difficult crossing of main lines to enter Cambridge station. The old alignment was retained as a siding for carriage storage until at least 1910 but disconnected at Brookfields - the point of commencement of the deviation half a mile west of the former Cherry Hinton station. Newmarket was home to all the major British racing and training stables which resulted in constant inward/outward traffic in horses going to and coming from race meetings all over the country. Additional horse traffic came from the annual sales at Tattersalls in December and the bloodstock sales which took place at the spring, summer and autumn race meetings. Around the turn of the twentieth century around 12,500 horses were being dealt with annually. Newmarket station was replaced with a much larger facility half-a-mile south on 7 April 1902. The town’s grand 'New' station opened together with the construction of the access road ‘The Avenue' giving better connections to the town and racecourse. Both were made possible by substantial financial backing from millionaire racehorse owner Colonel Harry McCalmont of Cheveley Park. The new station lacked goods facilities, and the old terminus was retained as the town's goods station and for all horse traffic. It was also used by excursion trains on race days until at least 1954. During WW1 the railway and goods yard were busy moving troops and armaments. The old terminus building was used as a temporary respite/hospital for wounded soldiers. At the 1923 Grouping the London & North Eastern Railway took control of all the lines around Newmarket, but already there had been a slow decline in rail travel owing to emerging road transport. WW2 was an exceptionally busy period for strategically positioned Newmarket station when traffic increased by 600%. The goods yard proved invaluable for the handling of armaments, including tanks and armoured vehicles as well as thousands of tons of road-making and building material for the many airfields under construction in East Anglia. Race meetings continued throughout the war years and many race specials had to be dealt with in addition to the military traffic. Warren Hill station closed in 1945. After the arduous work and neglected maintenance during the war the rail network and rolling stock were in a poor condition; the LNER suffered near-bankruptcy and could not afford the repairs and improvements necessary. 1948 brought Nationalisation with the lines around Newmarket coming under the control of the Eastern Region of British Railways. Newmarket station remained busy through the 1950s and into the 1960s and the line was never under threat from the Beeching axe. Two of the three remaining intermediate stations, Fulbourne and Six Mile Bottom were, however, closed on 2 January 1967. Newmarket goods yard closed on 3 April 1967. The line between Cambridge (Coldham Lane Junction) and Chippenham Junction, excepting the section through Warren Hill tunnel which always was single track, was singled between 1980 and 1985 with the exception of a long passing loop at Dullingham, and the station buildings at Newmarket were sold leaving just the north end of the station in use; it had been unstaffed since 2 January 1967. The station is, at the time of writing,served by one train an hour in each direction between Cambridge and Ipswich, with the service operated by Abellio Greater Anglia. Click here to see a 1904 1:10,560 (6") map showing the original approach to Cambridge station and the 1896 deviation. Click here to see 14 photos around Cambridge in 1970 by Alan Brown. Click here to see a 5 minute film by signalman Todd Firman called Dullingham Signal Box - The :Late Shift. Route map drawn by Alan Young. Tickets from Michael Stewart, Totem from Richard Furness. Bradshaw from Nick Catford. Special thanks to Darren Kitson for his research notes and David Farrant for information about Dullingham. Great Eastern Railway Society for various documents, English Heritage for a free licence to reproduce two photographs and The Newmarket Local History Society for permission to reproduce some text from their web site. 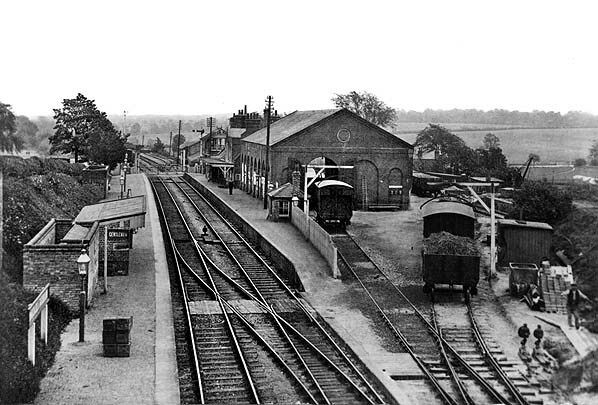 Dullingham station looking north-west from Farm Bridge c1910. The bridge was destroyed by a German bomb in during WW2. The station had two platforms, the down platform (left) being noticeably longer than the up in order to accommodate the goods sidings. A large brick goods shed is sited behind the up platform. The 1 ton 10cwt yard crane can be seen to the right of the loading gauge. The tall signal box is seen beyond the station building on the up platform. Note the gents' toilet adjacent to the shelter on the down platform. 1902 1:2,500 OS map shows the layout of the station and goods yard. The up platform is shorter than the down to accommodate the siding into the goods yard. The main part of the goods yard is to the west of the London Road level crossing, on the up side; it comprises a large goods shed behind the up platform; a siding runs through the shed and a loop from it runs round the shed to the south. There is a head-shunt off this loop adjacent to the small yard crane. There is a siding serving a cattle dock and pens entered from trailing points on the east side of Station Road opposite the Station Maltings, which are also rail-served with a siding running alongside a loading dock. The signal box is sited on the up platform close to the crossing. A second lock-up goods shed is shown on the down platform. Note the well (W) on the south east corner of the goods shed. Unusually no weighbridge is shown, and GER records show a weighbridge was not provided at the station until 1909. Two railway cottages are seen at the sharp bend in Station Road. Farm bridge is seen to the west of the station. Click here to see a larger version of this map. Looking south west c1910 at the Station Road level crossing and, beyond it, Dullingham station. The signal box is partly obscured by the crossing gate. The siding serving the Station Maltings is seen on the left as well as one of the malthouse buildings. On the right is the small cattle dock which, like the dock at Six Mile Bottom, can be loaded only end-on. Railings have been provided along one side of the dock to prevent livestock from falling onto the down line. Dullingham station entrance circa late 1950s. The timber extension between the two wings of the building is a later addition. It is difficult to make out, but the two-storey station house has been extended on its south-west side at some time. This flat-roofed extension can be seen between the house and the goods shed. The station building at Six Mile Bottom was similarly extended. The siding running through the goods shed is seen on the left. 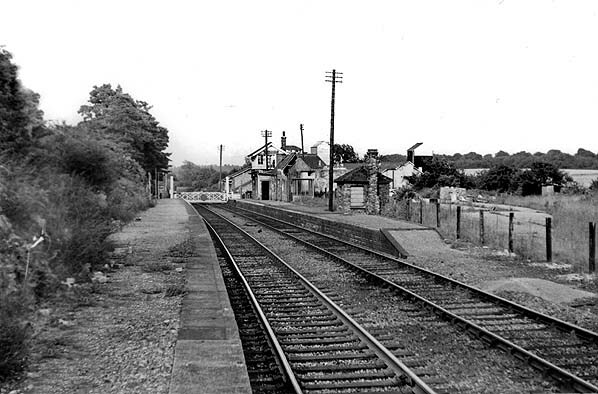 The main station building at Dullingham seen in January 1961. The original N&C building is the two-storey station house with the pitched roof and the single-storey wing alongside to the east. The west side of the building has been extended. This extension seen here to have a flat roof was probably built by the Great Eastern Railway. The east end of the building with a sloping roof is the gents' toilet. The station buildings at Dullingham during demolition in February 1972. With the loss of the waiting rooms the only weather protection now provided is a bus shelter. 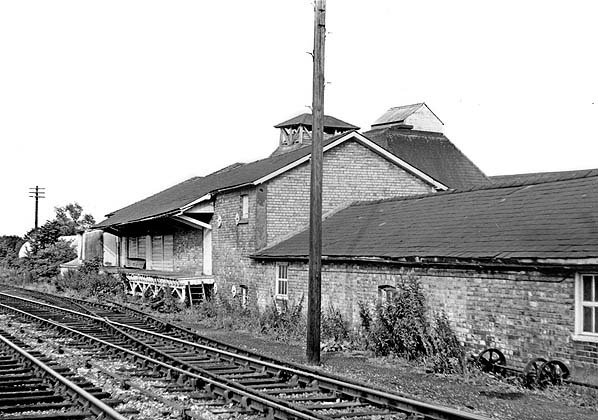 Dullingham Station Maltings on the east side of Station Road in February 1972. The siding running alongside the timber loading dock is still in place. Having been empty for many years the building was used as a grain store at this time. Dullingham down platform seen from a passing DMU in June 1973. The bricked up gents' toilet was still standing at this time.